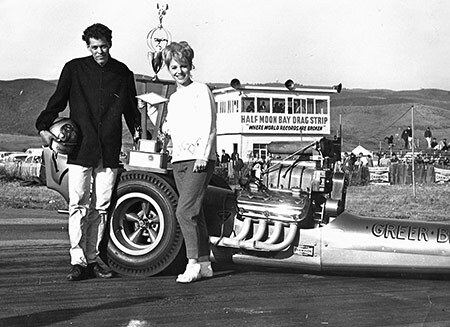 It is not possible to talk about drag racing in Northern California without mentioning Jim McLennan. An inductee to the Bay Area Sports Writers' Hall of Fame and the National Hot Rod Association's Hall of Fame, Jim was selected in 2007 to the prestigious International Drag Racing Hall of Fame by none other than Don "Big Daddy" Garlits. Jim McLennan's contribution to the sport of drag racing is immeasurable. He did it all-drove 180 mph slingshot dragsters; ran Champion Auto Parts (a retail speed and machine shop); and, owned and operated several race tracks, including Champion Speedway which he built from the ground up. Although Jim McLennan died in February 2007, his legacy is carried on today by sons Bobby and Mike, who continue to build, tune, and drive top fuel dragsters as part of NHRA's Hot Rod Heritage Series. Jim's life long passion for hot rods and racing started in his teens. While at San Francisco's Balboa High School, Jim worked in a gas station. He could fix anything, but what he loved to do was make cars go fast. He was well known out on the Great Highway near San Francisco's Ocean Beach for his street racing prowess with a '51 Chevy powered by a souped up V-8 Oldsmobile engine. 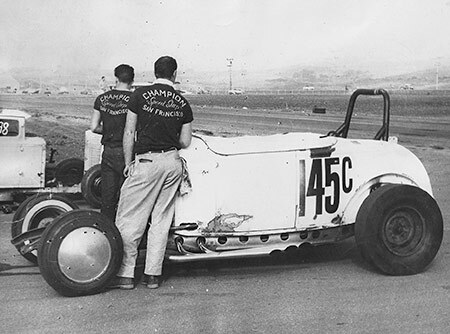 In the 1950s, as almost all activities relating to hot rods and drag racing revolved around a car club, Jim became a member of San Francisco's Pacers Car Club, and was instrumental in moving the racers off the streets and onto the drag strip. 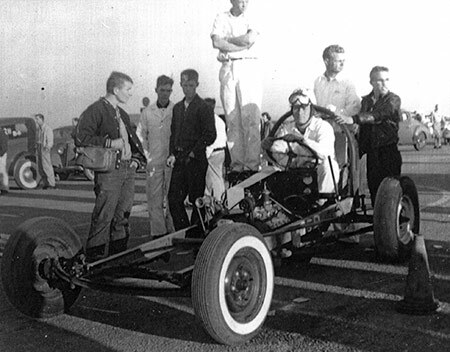 As early as 1955, Jim was racing a flathead-powered dragster at the strip. The problem was that there were very few tracks in those days to drag race. But, that would all change when Jim stepped in and rescued the closure of Half Moon Bay. 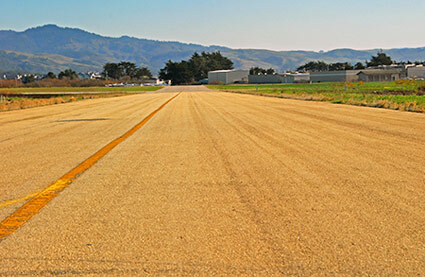 The airstrip at Half Moon Bay had been used by a couple of the local car clubs (the Lightning Rods and the Piston Pushers) as a place to race legally, but the city wanted improvements and insurance. Without the money to sustain their pastime, the car clubs had to give it up. By this time, Jim had already opened Champion Auto Parts in South San Francisco. 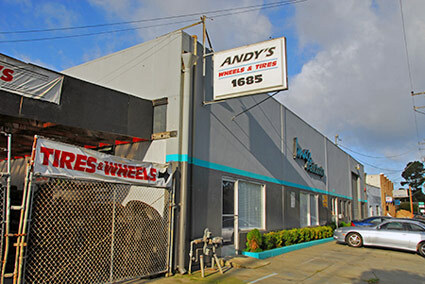 His speed shop quickly became "the place" to go for rodders seeking specialty parts, hot tune ups, or to just hang out. 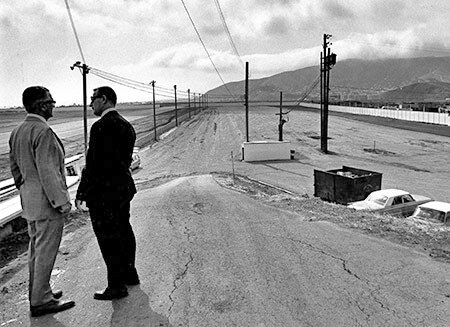 When Jim heard that a 3000' long, 60' wide ribbon of concrete was available, he quickly negotiated a lease with the city and took over the track. 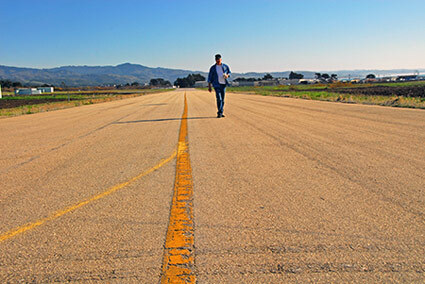 Jim turned this remote little auxiliary airport into the hub of drag racing in the late 1950s. 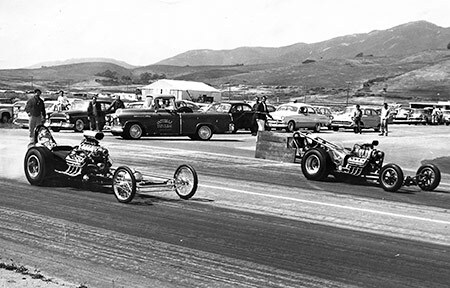 With Half Moon Bay and Cotati (which Jim also owned) open on alternate weekends, drag racers in Northern California finally had a legitimate option to street racing. 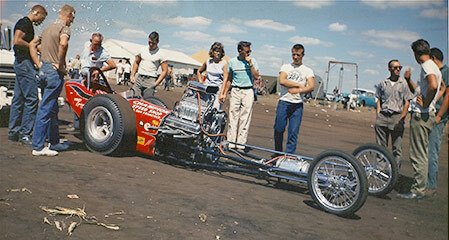 Through all this, Jim still found time to be the wheelman for the Champion Speed Shop-Ted Gotelli fuel dragster. 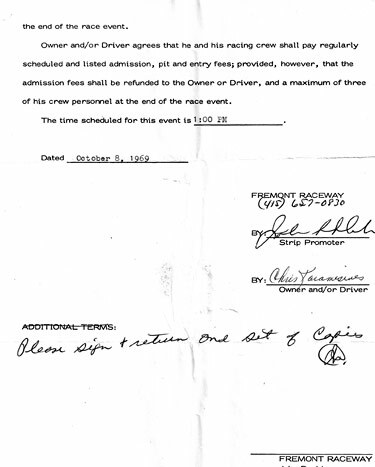 Talk about "having your cake and eating it too"--Jim enjoyed the rare privilege driving his own race car at a track he owned. But, the time to take off the gloves and helmet was just around the corner. Jim had married his high school sweetheart, Dorothy Padilla, and he soon became a father with the arrival of Bobby in 1954 and Sandy in 1955. 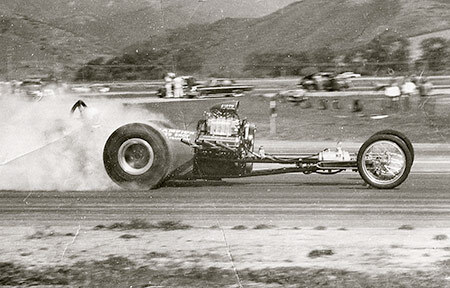 By 1961, the dangers of driving a top fuel dragster had escalated exponentially. With improvements to supercharger and fuel delivery systems, the engines had become very powerful. Drivers were getting hurt everywhere including close friend Bud Barnett at Jim's own track (HMB). Family and business concerns convinced him to turn the job of driving a fuel dragster over to another. When Jim's long time partner, Ted Gotelli, left to form his own team, Jim turned the driving duties over to 19 year old Sammy Hale. It turned out to be a very fortuitous decision. 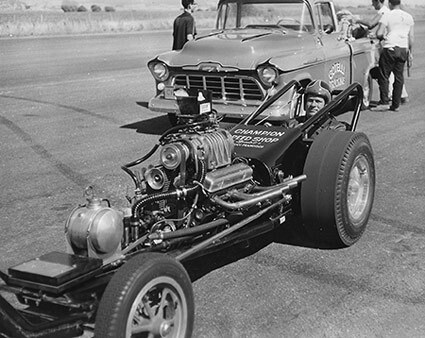 With Sammy behind the wheel of a new Kent Fuller car, the Champion Speed Shop Chevy-powered, Algon-equipped, fuel dragster rose to the No. 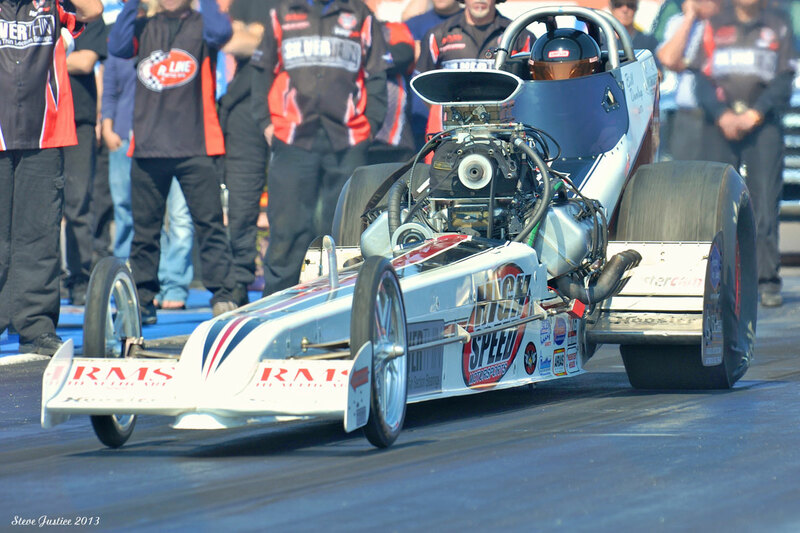 2 position on the Drag News' Mr. Eliminator list. However, the strain of constantly touring the country to defend the spot started to wear on Jim. At the end of 1962, he reluctantly sold the dragster to Masters-Richter. Jim now turned his attention to a most ambitious project-building Champion Speedway in Brisbane. 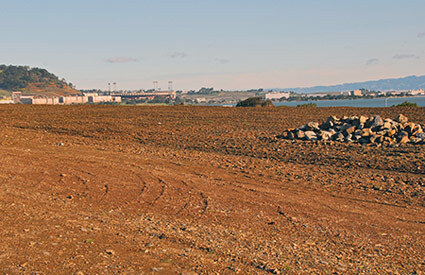 On the site of an old landfill just south of Candlestick Park, Jim constructed a ½ mile oval track, later adding a 1/8 mile drag strip on the speedways straightaway. 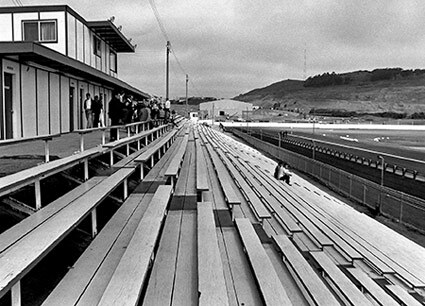 This NHRA-sanctioned facility was the mainstay of the Bay Area auto racing scene until its closure in 1979. The following pictures provide a brief yet vivid peek at Jim's contributions to the development and popularity of hot rodding and drag racing in the Bay Area. 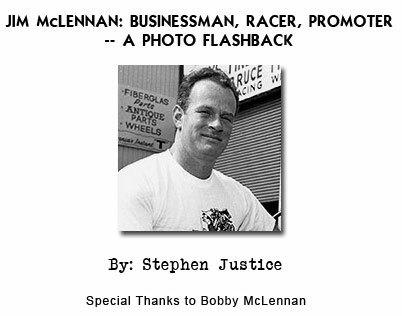 It is a glimpse back to the sport's infancy, a time when pioneers like Jim McLennan would take drag racing forward and make it a permanent part of the pop culture landscape. 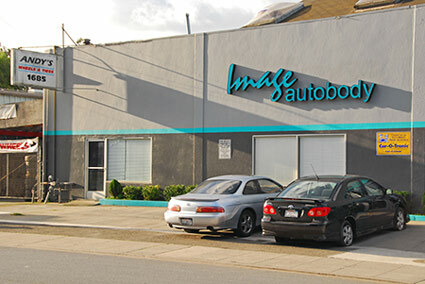 This was the original Champion Automotive which opened in 1957 on El Camino Real; Colma Creek was immediately behind this building. How did Jim come up with the name "Champion"? Before this building housed Jim's auto parts store it had been Champion Fence Company. 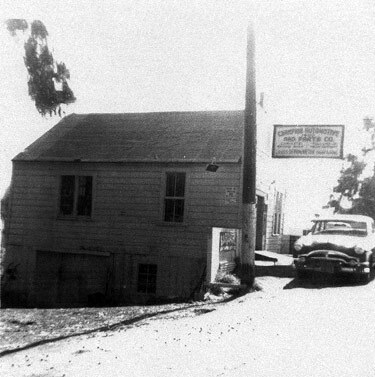 Jim moved his speed shop to 1685 Old Mission Road in 1958 which was around the corner from the original location. 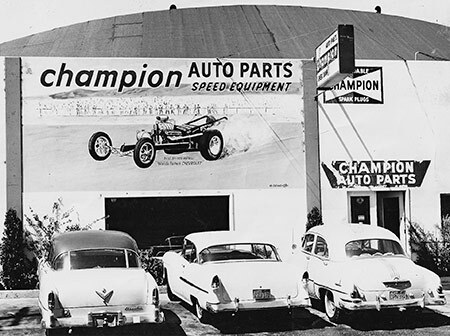 The Champion Auto Parts building today is home to a tire store and an auto body shop. Also, done are the American built automobiles that used to occupy all the parking slots in front of the speed shop. 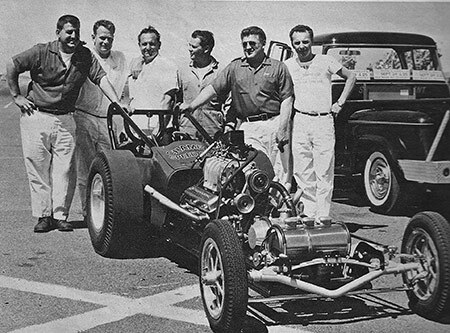 Bruno Gianoli, Don Smith, Jim, and an unidentified employee; Bruno ran the machine shop and Don was Jim's partner in both the business and the drag strips. The view customer's saw when they talked through the door of Champion Auto Parts. Taken in the back of Champion Speed Shop, this photo appeared in Drag News much to the irritation of both Jim and Jerry Light (owner of Vic Hubbard Speed Shop). Jim's biggest rivals at the time are standing there at the back of the dragster-Jerry and Denny Forsberg. (far left is Denny Milani; Jim is in the foreground and that is a Ford engine!! he's working on). 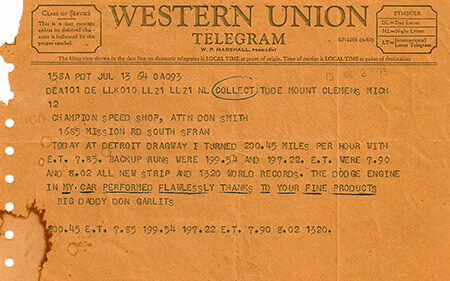 A wire from "Big Daddy" dated 07/13/1964 sent to Don Smith at Champion Speed Shop. Born in Chicago in 1932, the family moved to San Francisco when Jim was ten years old. By the time Jim graduated from Balboa High School in 1950, he was already a confirmed gear head and hot rodder. 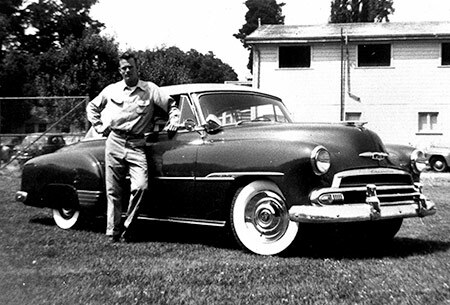 He was a member of the Pacers Car Club out of Daly City, and was well known out on the Great Highway for his racing prowess with his 1951 Chevrolet. Jim's dad was a police officer and did not look favorably on his son's need for speed. Jim later became president of the Pacers and started racing the club project cars at tracks like "Little Bonneville" in San Jose. 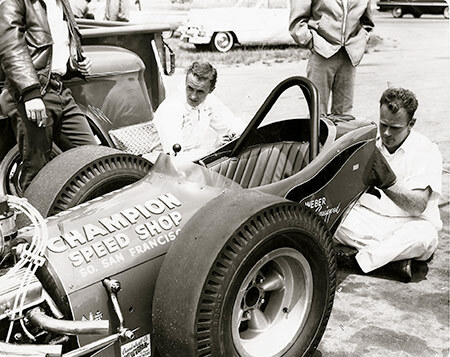 In 1958, Jim teamed up with Ted Gotelli and their Champion Speed Shop-Gotelli Spl. would set many track and Standard 1320 records. 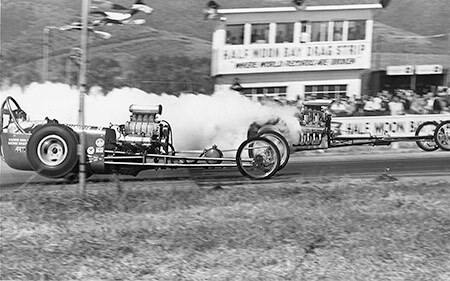 Jim later built two more fuel dragsters, the most famous of which was the Champion Speed Shop Spl. driven by Sammy Hale. Jim's street machine that he raced out on the Great Highway-a 1951 Chevy powered by an Olds engine equipped with four carburetors. 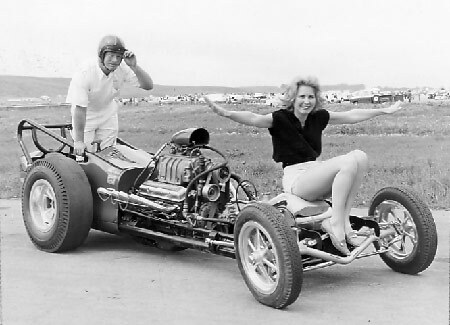 This was Jim's first race car--a flathead-powered rail (of sorts)>1955. 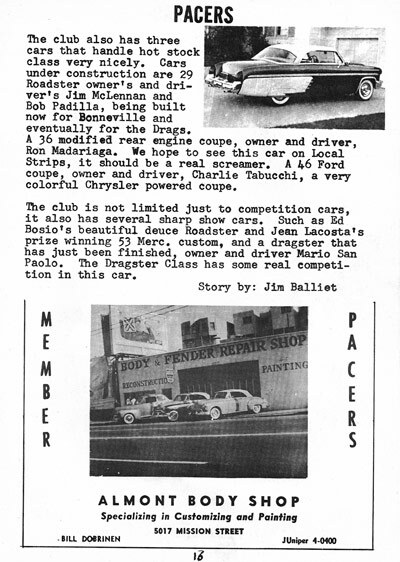 Drag racing in the 1950s revolved almost entirely around the car clubs; Jim was a member of The Pacers , just one of many in the Bay Area at the time (see listing above) . 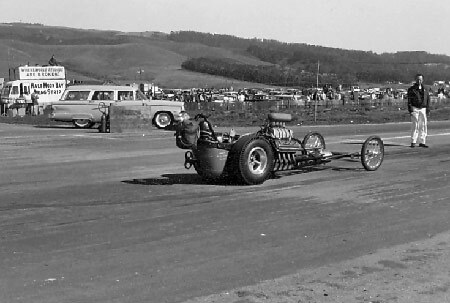 Before HMB, Cotati, and Fremont, organized drag racing was held at a facility in San Jose called "Little Bonneville" (near King and Storey Rd). Jim is kneeling front row and center in front of the Pacers' modified coupe. 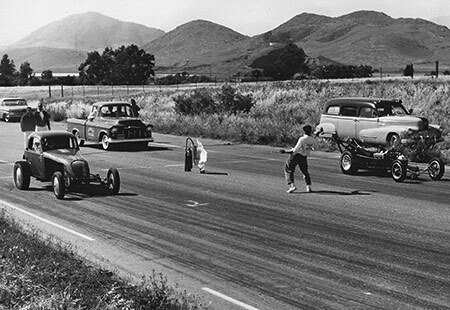 Jim (far side) won this final round of Top Eliminator versus Ewell & Stecker at the San Luis Obispo Timing Association's (SLOCTA) drag strip at San Luis Obispo in 1957. Champion Speed Shop Spl.- Gotelli racing Ed Cortapassi in The Glass Slipper at Vacaville (1959). 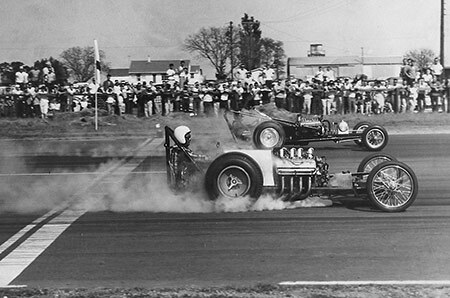 I think it is safe to say Emory Cook (near side) lost this round of eliminations at Vacaville (1959) to the Gotelli-Champion Speed Shop Spl. 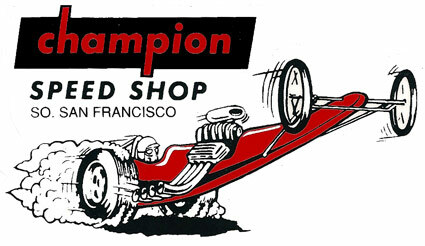 Cover shot of the Champion Speed Shop-Gotelli Spl. when it set a new Standard 1320 B/FD record of 8.77-171.45 at HMB. 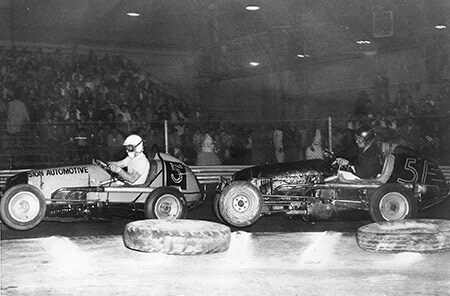 Jim and Ted put a blower on the rail for the 2nd Annual U.S. Gas and Fuel Championships; Bakersfield CA 1960. 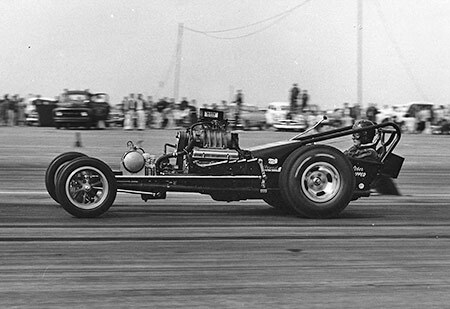 By the fall of 1960, the Champion Speed Shop-Gotelli Team consisted of Ted's black Scotty Fenn dragster with a blown Chrysler and a new Scotty Fenn rail with a blown Chevy. Initially Jim drove the Chevy and Bud Barnett drove the Chrysler, but at times one or the other drove both cars. 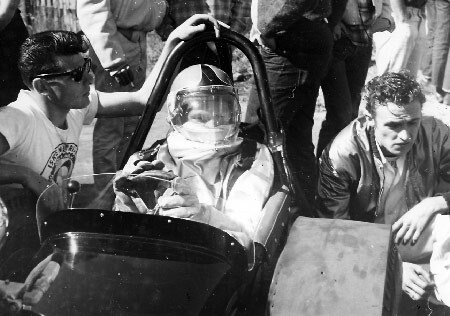 In March 1961, Rod Stuckey sustained severe burns from a fire while driving his top fuel dragster at HMB. To help pay the medical bills, the Organ Grinders organized a benefit race on his behalf at HMB. Bud Barnett drove both cars that day, and as fate would have it, suffered similar serious injuries from an engine explosion right before the lights. This accident for all intents and purposes ended Bud's driving career. Ted Gotelli took a torch and cut up what was left of that Scotty Fenn rail. The black Gotelli-McLennan Spl. 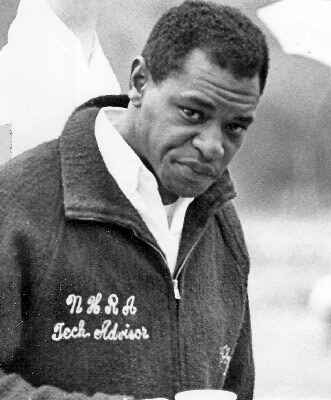 at the 1961 March Meet. 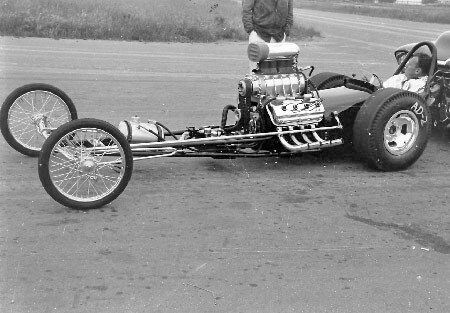 This is the dragster in which Bud Barnett incurred his horrific burns from a fire at the Rod Stuckey benefit race at HMB in April 1961. 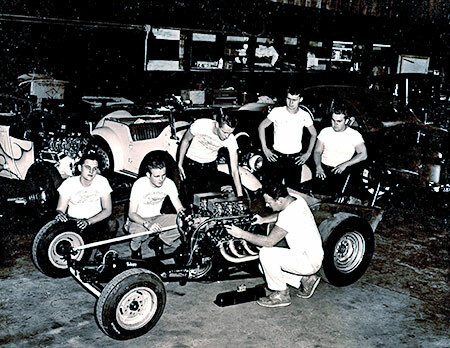 Jim built this Scotty Fenn car, the red Champion Speed Shop-Gotelli Spl., in 1960 when Ted made the decision to put a Chrysler in the original Scotty Fenn rail. This photo was taken for the October 1961 issue of Hot Rod Magazine when the magazine ran a 3-page feature called "Rail for a Reason". 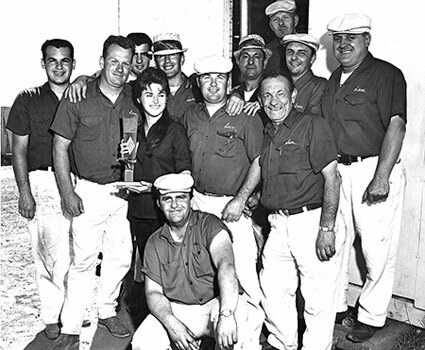 Left to right: John Zucca, Jim, Ted Gotelli, Bruno Gianoli, Marcel "Lem" Lemmelet, and Bud Barnett. Jim campaigned this AA/GD during the NHRA fuel ban, but could never get it to perform the way he wanted and quickly returned to fuel racing. The Twin had a 6:71 blower in back and a 4:71 in front, both equipped with Algon injectors. He was also wearing what possibly could be the very first fire suit-(Cotati 1961). After the accidents to Rod Stuckey and Bud Barnett, Jim got a proximity suit from the San Francisco Airport Fire Department. He planned to test it by igniting gasoline tossed onto the ground and then running through the flames. Unexpectedly, Jim tripped and fell into the fire during the experiment, and after rolling around on the ground in the inferno, discovered that the suit actually worked. But, it was not the answer to the problem of fires caused by engine explosions; the suit was simply too hot and uncomfortable for driving a race car. Sammy Hale complained that it leaked fiberglass and made one itch all over. After giving up on the AA/GD experiment, Jim returned to nitromethane. 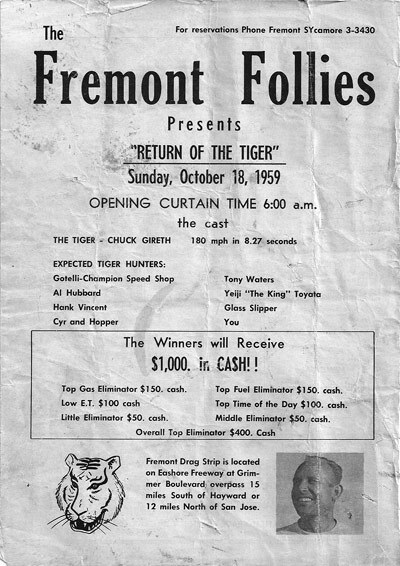 In this race at Fremont In 1961, he beat 'Slim' Sumner driving the Sumner-Bert-Mewes A/GMC for top eliminator. Jim wearing the proximity suit prior to a pass in Ted Gotelli's new Fuller car. After Bud's accident at HMB, Ted cut up the Chassis Research car and ordered this Fuller car. 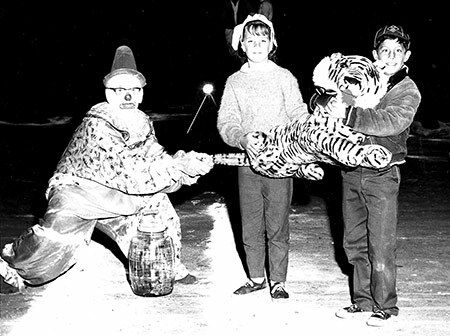 Kneeling at Jim's right is Ted Gianinni (The Owl) and on the left a very young Sammy Hale. Jim could not believe how easy it was to drive the Fuller car-said it was like driving a Cadillac compared to the Chassis Research car. This was also right around the time Jim and Ted Gotelli split up. Jim was so impressed with Fuller's design that he went to Southern California and ordered one for himself. This would be the car that Sammy Hale was so successful in driving, eventually becoming holders of the No. 2 spot on Drag News' Mr. Eliminator list. 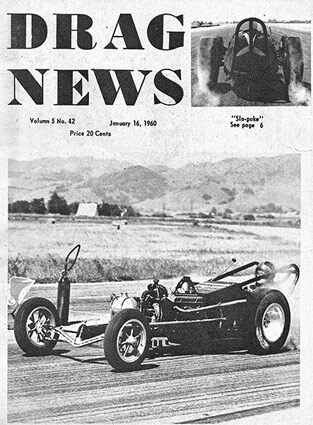 Jim in Ted Gotelli's new Fuller car; after Jim and Ted split up, Jerry Card (El Cerrito),Archie Liederbrand, and Jesse Schrank each drove the car, but briefly. Ted eventually settled on Glen Leasher who took the car to runner up honors at the 1962 March Meet. 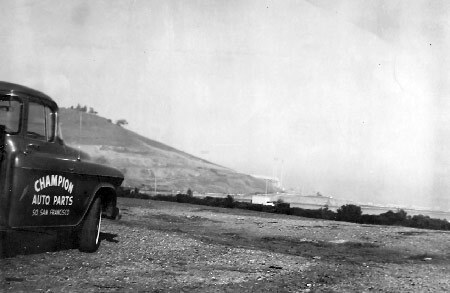 Jim driving Gotelli's new Fuller car vs. the Schrank Bros at HMB (1961); After Bud's fire in April, Jim went to work exploring ways to prevent drivers from getting burned as had happened to Rod and Bud. In this shot, Jim is wearing the proximity suit he got from the SF Airport Fire Department. 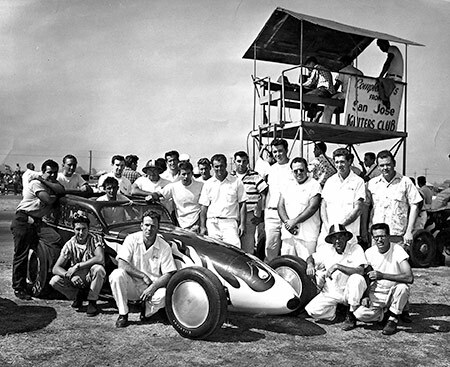 Photo of the Fuller (CSS #1) and Fenn (CSS #2) dragsters at Cotati in early 1962; left to right: Bobby McLennan, Jim, Chet Thomas, Bruno Gianoli, Don Smith, Tom McGuire, and Sammy Hale. Swinging" Sammy Hale (a nickname given to Sammy by Don Smith) and Jim packing the chute. 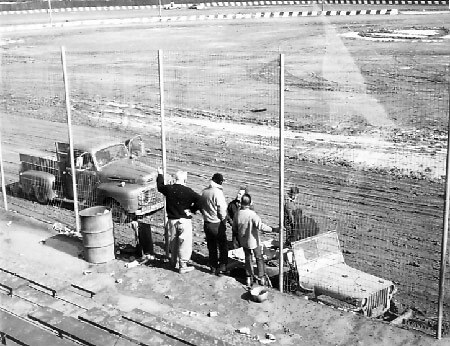 The Fuller car in the pits at HMB; Jim had decided it was time to get out of the seat and turned the driving chores over to 19 year old Sammy Hale. With Sammy at the controls, the Champion Speed Shop Spl. 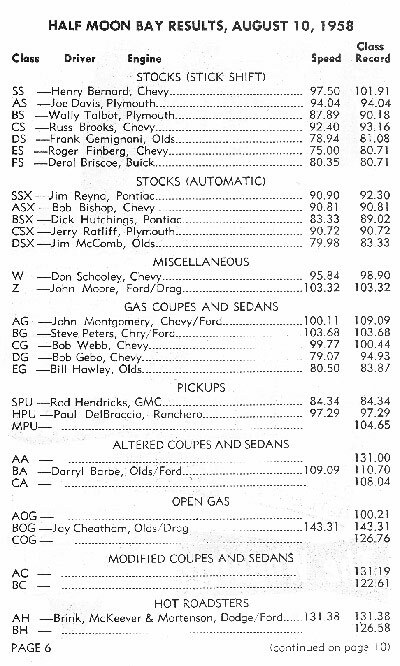 held down the No.2 spot on the Drag News Mr. Eliminator Record List for most of 1962 and they did it with a 364 cid Chevy, a 4:71 blower, and Algon Injectors. Classic shot of the Fuller car with Sammy smoking the hides at pastoral Half Moon Bay. 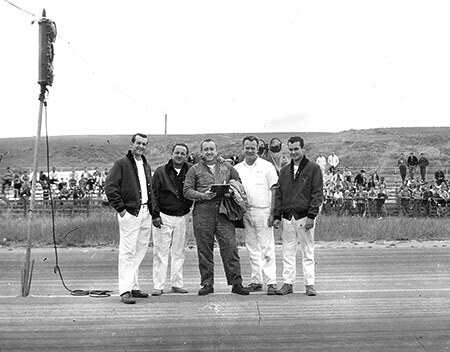 Possibly the proudest moment for this Champion Speed Shop rail came on July 22, 1962 at HMB. 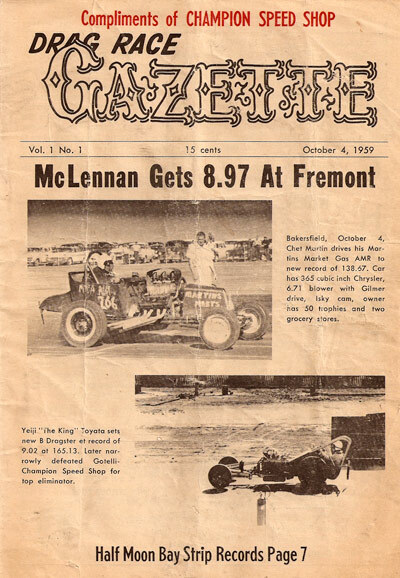 In what had been coined as a real David versus Goliath encounter, Jim McLennan, Don Smith, Sammy Hale and a Gary Rowan-prepared 364 cid Chevy took on the mighty 454 cid Chrysler of Don Garlits and Connie Swingle. Connie, in the left lane, came out of the gate in a huge veil of smoke and was soon overtaken by an unfazed Sammy Hale. At the finish line it was the team from So. San Francisco by more than a car length with a virtuoso 8.40-180.36. In August 1962 Bruno Gianoli and Sammy Hale towed the Champion Speed Shop car back to Cordova, Illinois for the World Series of Drag Racing. These unique injectors were built by Bruno Gianoli and called "The Swifty". Champion Speed Shop in the pits at Cordova; behind: Chris "The Greek" Karamesines who had recently lengthened his TE 448 chassis. A replica of the Champion Speed Shop Spl. was featured in the1996 Oakland Museum Exhibition, Hot Rods and Customs: The Men and Machines of California's Car Culture. This 200" Logghe chassis recreation is currently on display at Brizio Street Rod in South San Francisco. 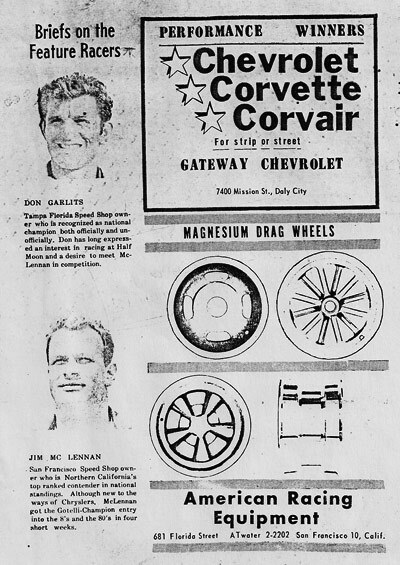 In October 1962, Jim challenged Don Garlits for the Drag News Mr. Eliminator No. 1 spot. They had already left for Florida when they received news that Vance Hunt had taken the coveted position away from Garlits. As a result, Jim and Sammy headed for Houston, Texas, for the showdown with Vance. Vance won the first round, but Sammy countered with a win of his own in round two. There was a ditch off to the side of the asphalt, and because the car had been unusually skittish that day, Sammy wanted some additional weight on the front end. However, the team did not want to make the car any heavier and Sammy was overruled. When the final was run, the car got dangerously close to that ditch and Sammy had to lift in order to save the run. Although "the little Chevy that could" did not grab the coveted top spot away from Vance, it did set low e.t. at 8.33. A few weeks later, Sid Masters approached Jim and asked him to drive the M&R car to see what he thought was causing the handling problems they were having. Jim made a run in the old M&R (purple car) car and afterwards told Sid the best thing to do was to put a cutting torch to it At the same time, Jim was contemplating parking the Champion Speed Shop Spl. because he was so busy constructing Champion Speedway. This was a million dollar deal and left Jim with no time to race the Champion Speed Shop dragster. Sid wanted to purchase the Fuller car. Jim was so confident that Sid's combination would be a success that he promised them the car for nothing if it did not set a new speed record. They put M&R's 392 cid Chrysler in it and set a new 1320 speed record of 192.30 at HMB the first time out. M&R then took it to Fresno, San Gabriel, and Lions and set new speed records at those tracks, too. 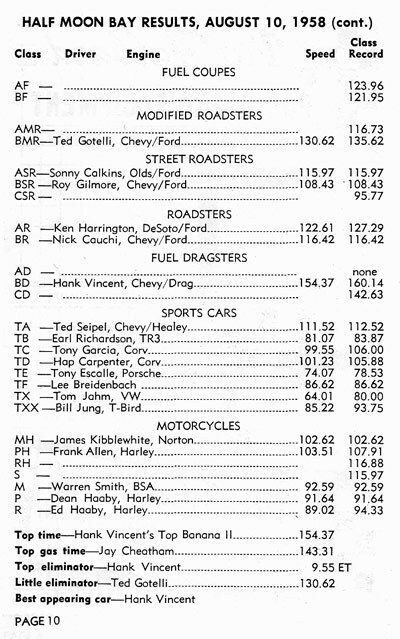 Sid and Rick were more interested in running big speeds than winning races, but they also won their fair share of top eliminators. On November 24, 1962 at San Gabriel, Sammy Hale defeated Ewell, Stecker, and Kamboor the last time the feisty little 364 cid Chevy would defend its number two Mr. Eliminator position. 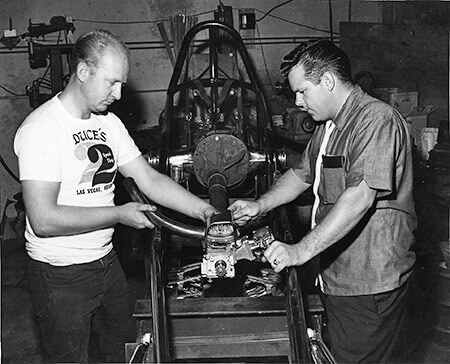 By January 1963, Sid and Rick had purchased the Fuller chassis, repainted the dragster yellow, and the rest is history. Big' Bob Haines in the Fuller car after the Masters-Richter makeover. Can you believe he's looking at her face? 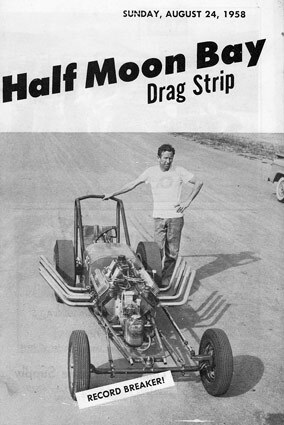 Jay Cheatham and his record-holding B/GD graced the cover of this HMB program; Jay was killed the following March during the 1st U.S. Gas & Fuel Championships. A Half Moon Bay souvenir program from 8/24/1958-12 pages of features, results, ads, and photos. 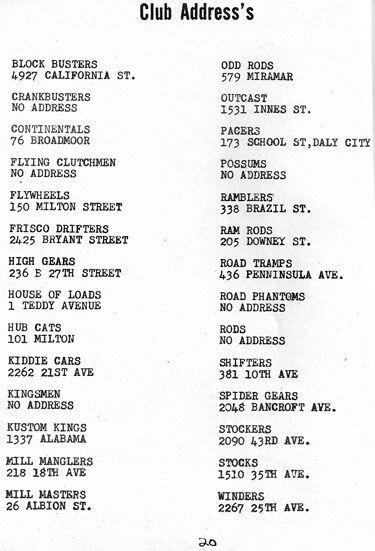 Before Al Caldwell wrote his famous "Northern Briefs" column in Drag News, he published his own Drag Race Gazette-Vol. 1 No.1 seen here. 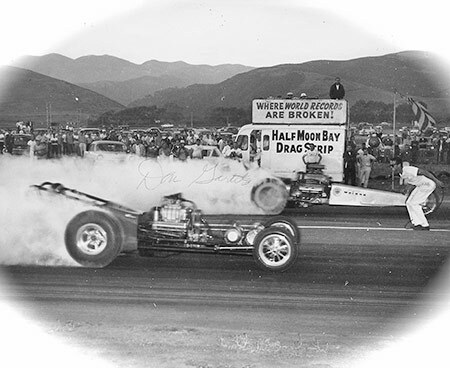 Don Garlits was a frequent competitor at Half Moon Bay over the years. 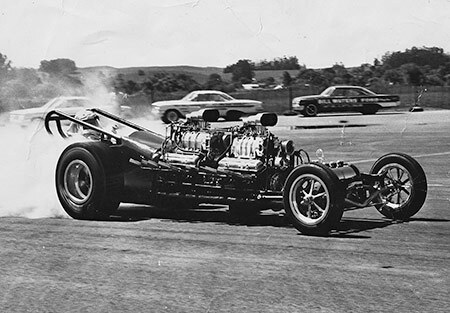 By September 1960, Ted Gotelli had replaced the Chevy engine with a Chrysler mill and challenged Garlits to a match race at HMB. 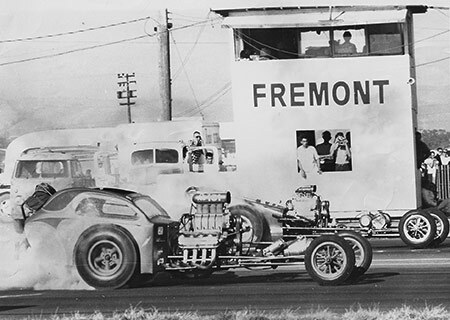 Ron Lawrence's Fremont Drag Strip was a formidable rival in the late 1950s and early 1960s for the drag racing fan and racer's loyalty ; HMB and Fremont frequently went head-to-head staging big meets on the same dates. 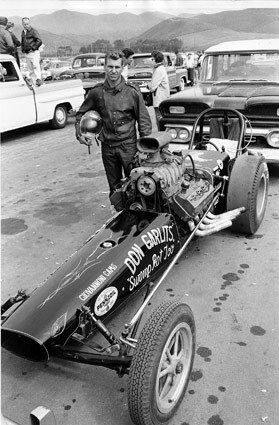 Ed Garlits was better known for his blown Chrysler gas dragsters than Swamp Rat. 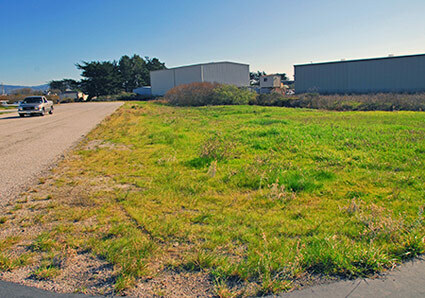 The view at HMB looking NE from the return road; the drag strip would be on the racer's left and Hwy 1 on their right. "The Snake" with HMB's 'theme girl' Tammy Taylor (1964). Note: the Greer-Black-Prudhomme car had been lengthened and repainted (from yellow) back to a shade of orange (the car would be sold in December 1964). 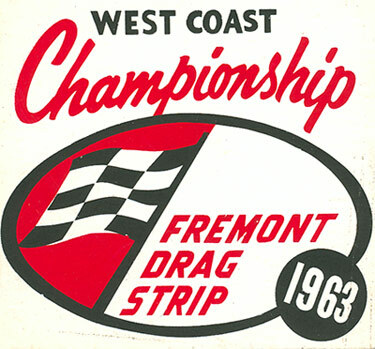 HMB hosted many championship drag races from 1957 to 1969 including the California Fuel and Gas Championships. 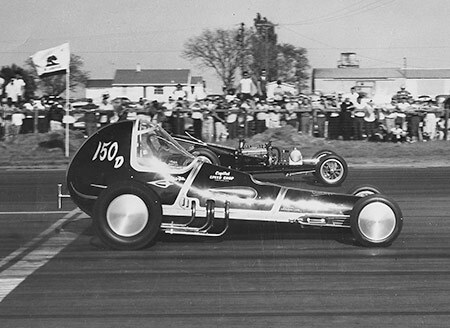 This shot taken in 1963 features the Moody-Zeuschel-Fuller top fuel dragster against The Dragmaster. 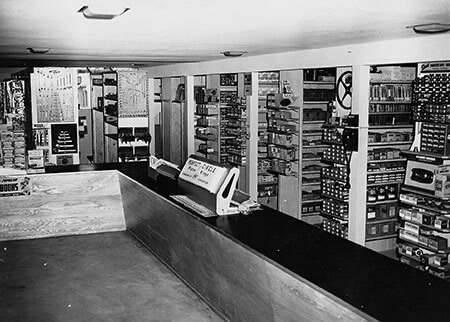 The portable bread truck that doubled as a timing tower was later replaced by this permanent tower. After the track closed, the HMB Fire Department torched it for a training exercise. The staging lanes at Half Moon Bay; the lettering barely visible at the extreme left of the photo designated one of the lanes; looking east back toward Hwy 1. 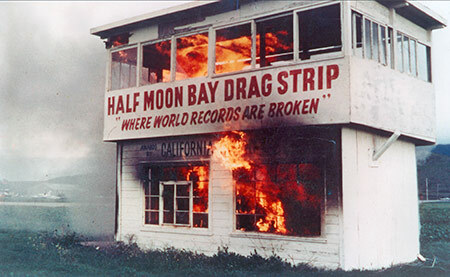 HMB, also called the "Pebble Beach of Drag Racing", ran north to south. Ron Reed, a current mechanic at the San Mateo/ Half Moon Bay County Airport is standing at the spot that starter Andy Brizio would have occupied when he flagged off a race. 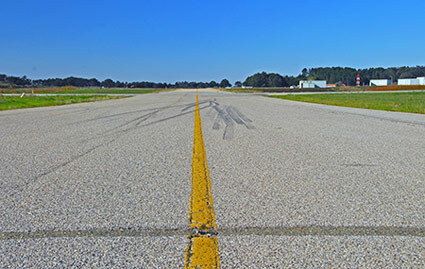 The drag strip was actually a taxi runway still used today--the view from the finish line. Though nice and wide (60'), the entire length of the runway was only 3000'. The finish line at HMB is still visible in the aggravate; this is the same surface that was last kissed by a pair of slicks back in 1969. The dense growth at the right obscures a deep culvert that angles into the end of the outrun; this is the same ditch that claimed the life of Denny Milani in 1965. 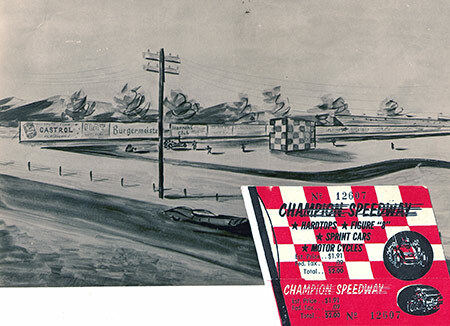 Champion Speedway was located on a parcel of land situated between Bayshore Blvd. on the west and the Bayshore Fwy (Hwy 101) on the east; entrance to the facility was on Beatty Rd. 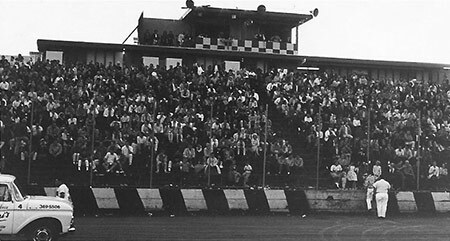 off Tunnel Ave.
Champion Speedway was built in Brisbane on land owned by the Southern Pacific Railroad. It had previously served as a landfill, so the smell was incredibly obnoxious during the excavation phase of the construction. Jim originally proposed to build it in Redwood City where the Oracle building now stands, but could not convince the city to issue the permits due to noise concerns. Champion Speedway was patterned after the famous Ascot Park in Los Angeles, and Included a ¼ mile oval on the inside of the bigger track. 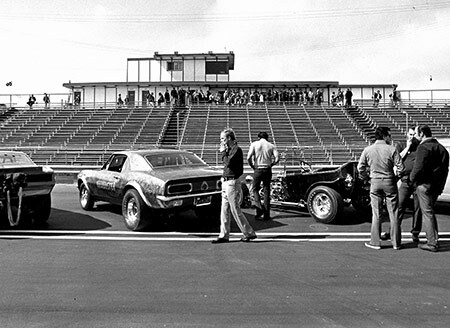 In 1967, the entire place was remodeled and a 1/8 drag strip was added to the facility. The view north toward Hunter's Point and Candlestick Park. Kent Fuller and Jim (background) surveying the grading for the speedway. 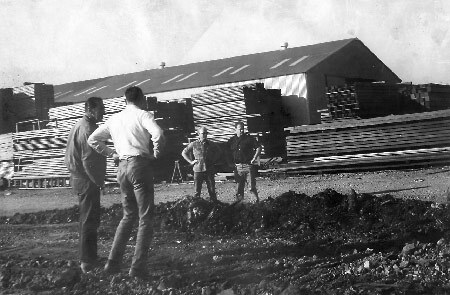 Kent had moved to northern California to expand his chassis-building business and was integral in the planning and construction of the speedway. A shot of the oval track taking shape. Champion Speedway was designed after the legendary Ascot Speedway (seen above) in Los Angeles. 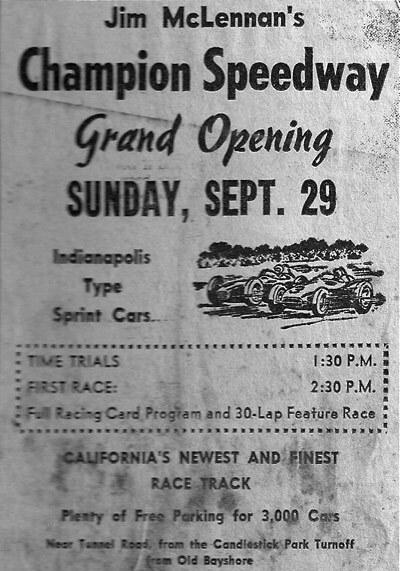 Champion Speedway cost a fan $2.00 to get in-that wouldn't even buy a bottle of water at the track today. Sprint Car action at 'The Speedway' back in the day. 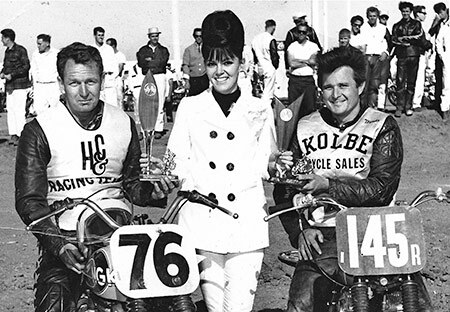 Motorcycle racing was an integral part of the speedway's offering-the trophy queen none other than the beautiful Cherie Hale (Sammy's better half). 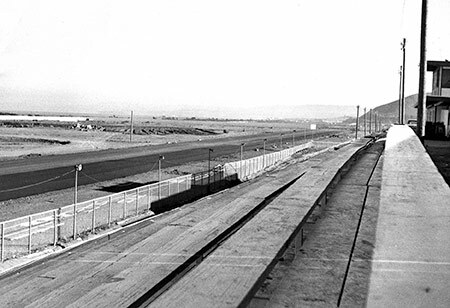 In 1967, the speedway was remodeled and a 1/8 mile drag strip added to the facility; NHRA's Jack Hart and a Southern Pacific RR executive checking out the progress; the view south toward San Bruno Mountain. Looking southeast toward Sierra and Oyster Points. 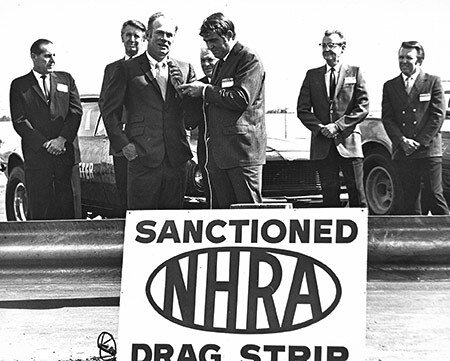 All the "suits" were there for the grand opening of the drag strip: SP's Bill Finsterbush; Wally Parks; Jim; Steve Evans; Jack Hart; and Bernie Partridge. 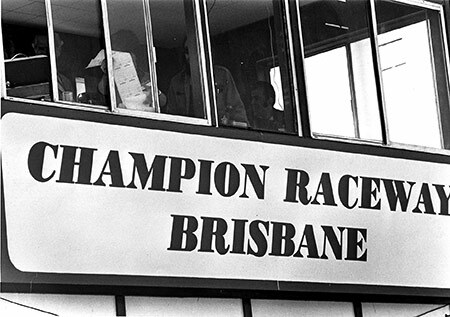 A young Steve Evans was the general manager and announcer at Champion Speedway. 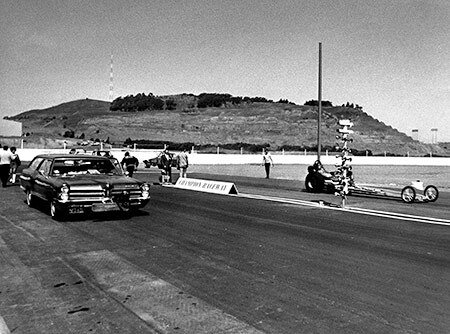 Opening day-with the light standards of Candlestick Park in the distance, the Cow Palace Shell top fuel dragster makes the maiden voyage down the 1/8 mile drag strip. 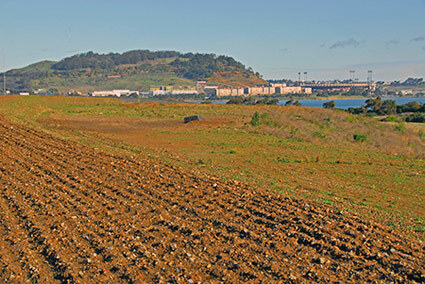 The view of the remodeled Champion Raceway looking north; though not visible in the picture, Candlestick Park was to the right and behind the hill in the background. Somewhere underneath all this dirt lie the skeletal remains of Champion Speedway; ironically, this acreage has come full circle, serving the City of Brisbane today as a landfill, but soon to become condos. 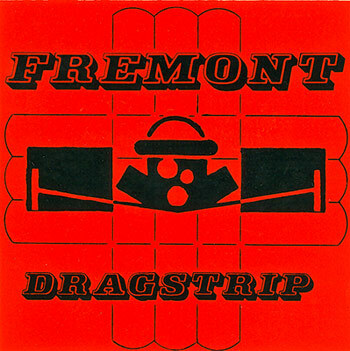 Jim took over Fremont Drag Strip in 1967. 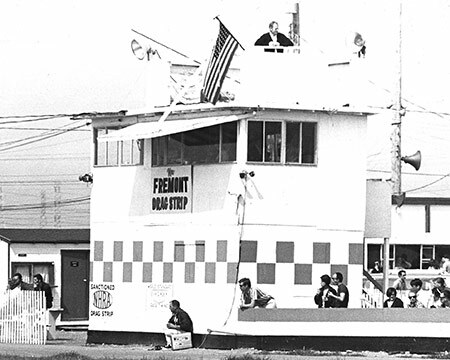 Jim taking in all the action from atop the Fremont Raceway tower; Bobby McLennan recalls, "I think we had just finished putting in the old Oakland Raiders stadium grandstands." 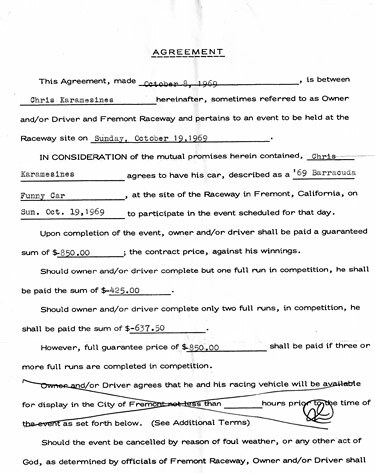 Good bet the contractual obligation agreements today are a lot more sophisticated - "The Greek" and and John Durbin's signatures grace this contract (1969). 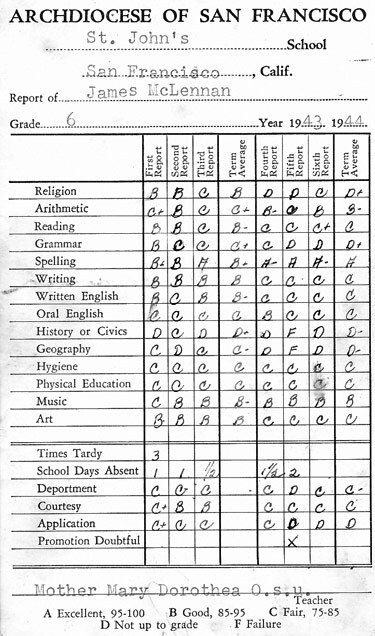 Here it is in black and white-Jim's 6th grade report card from St. John's. 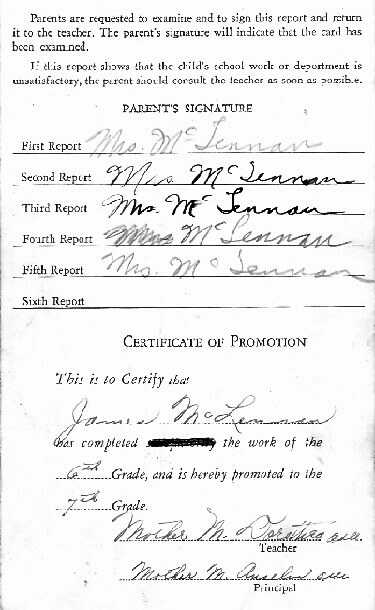 You have to love some of the disciplines that have disappeared from the school curriculum today. 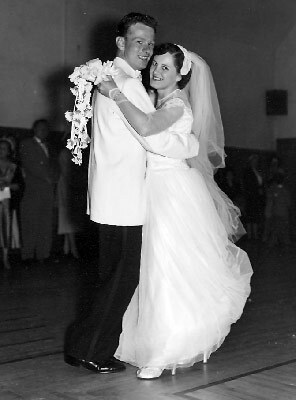 Jim McLennan and Dorothy Padilla on their wedding day. This picture was taken at HMB looking west toward the Pacific Ocean (which was right behind that hill); left to right: Don Smith, Ted Gotelli, Scotty Fenn, Jim, and Larry Gotelli. Jim and Micky Thompson were the best of friends, and in many ways pursued similar careers as drivers, businessmen, and track managers (Micky at Lions). 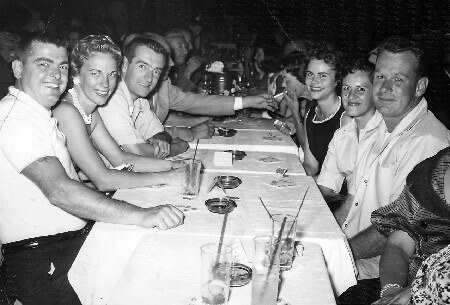 This shot was taken at Las Vegas with Micky, Judy Thompson, Don Smith, Pat Smith, Dorothy, and Jim. Andy Brizio under the poster; Sue Brizio in front of him; and, Debbie Brizio wearing the white gloves. 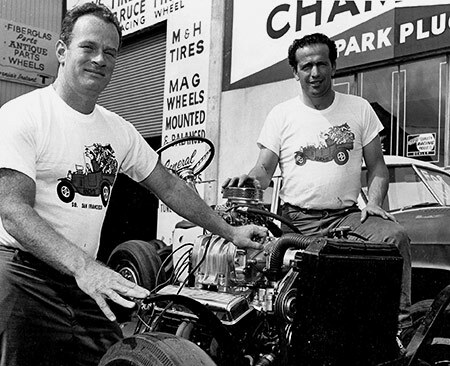 Jim and Andy Brizio in front of Champion Auto Parts flanking Andy's first "Instant T" hot rod-1967. 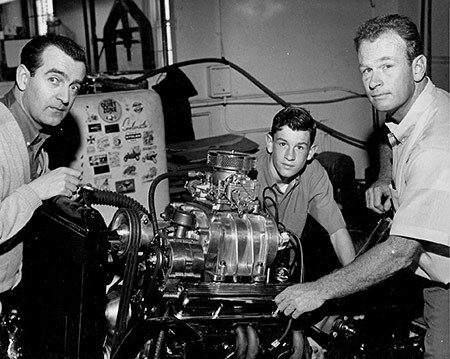 Don Smith, Bobby McLennan, and Jim in the shop at Champion Auto Parts with Andy's "Instant T"-1967. Cocomo" the clown ( ex-AMA cycle rider), Jim's daughter (now Sandy Stratton), and a fan from the motorcycle races at Champion Speedway 1964. Chassis builder Kent Fuller and engine whiz Dave Zueschel contemplating how in God's name they were going to get this lawn mower engine to fit in the frame. Richmond's Cloy Fitzgerald started his career working for Jim at HMB. 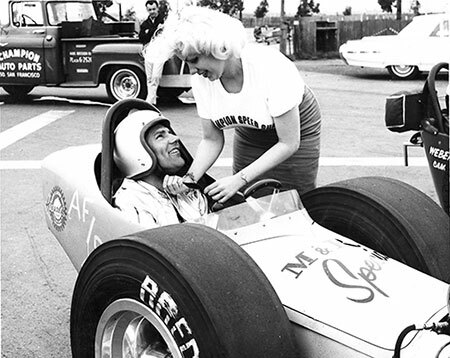 It was Jim who introduced Cloy to Bernie Partridge who later made him the NHRA Division Seven tech director. 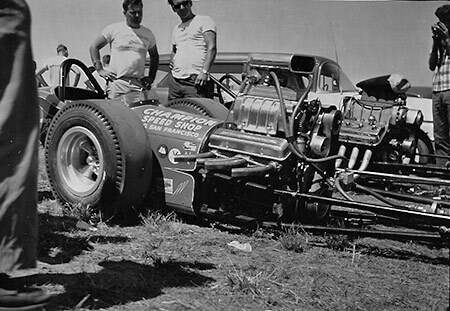 Sammy Hale: I bought a lot of speed equipment at Jim's shop for my Olds fast back sedan. I raced in a class called Olds Modified starting when I was 17 years old. When I was younger and lived in San Bruno, I was actually classmates with Larry Gotelli at Capuchino H.S. Then, my dad moved our family to Morro Bay. But, it seemed I was always bumping into some drag racers from San Francisco. I remember running into John Zucca at the Santa Maria drag strip once. I started driving for Jim when I was 19 years old. I started out as the typical grunt guy on the team, but after a few weeks Jim put me in the Scotty Fenn car just to warm it up. Then, I got to make a half pass at HMB and went 135 mph. The following week, I went 176 mph before damaging the crankshaft and ending our day. The learning curve went up sharply when I had to race Romeo Palimedes for the #5 spot on the Mr. Eliminator List. We won and things just took off after that. 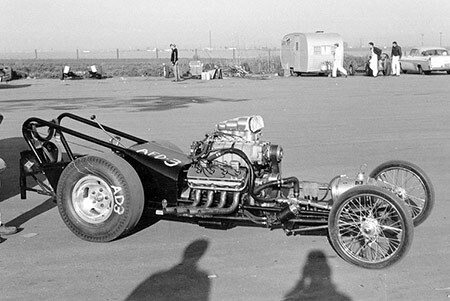 The dragster that made us famous was the Fuller car which made its debut on New Year's Day in 1962 at HMB. We were having problems with wheel stands that day, so Jim told me to slip the clutch for 200'. In the final we were matched against Slim Sumner and his modified coupe. We beat him and ran low e.t. of the day our first time out. That year, we must have defended our #2 Mr. Eliminator position seven or eight times. 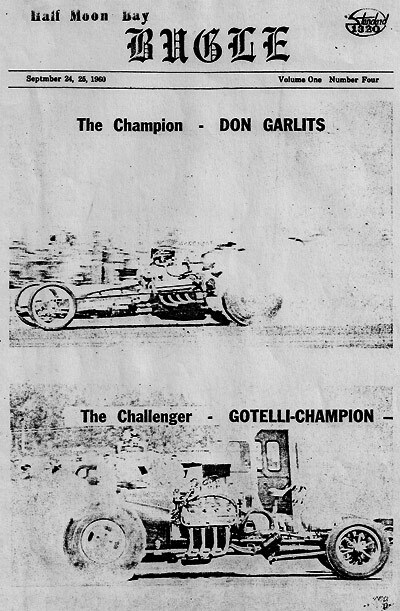 In October 1962, we challenged Don Garlits for the number one spot. But, he had just lost it to Vance Hunt, so we went to Houston, Texas to take on Vance. The right lane was real difficult that day; the car wanted to wheel stand and drift to the right. This strip did not have a guard rail and there was a big drop off at the edge of the asphalt. Vance had replaced J L Payne and I was getting out first on his new driver. They won the first round, but I returned the favor in round two setting low e.t. in the process (8.33). Delegated back to the troublesome right lane for the final, I knew it would be an uphill battle. Nobody on the team wanted to add any weight to the front end, so I knew I would have a tough time of it. I took it out as far as I could, but had to get out of it to keep it on the track. By the time I stabbed it again, he had gone past me. It was a race we should have won, but we could not agree on the best way to set up the car. The disappointment from not winning the number one spot spilled over to other things once we got back to California. I think Jim was tired of all the traveling and wanted to spend more time at home. Not long after we returned home, he sold the car to Masters-Richter and I was out of a ride. I did drive for Ted Gotelli in 1964 and much later for Jessie Perkins. All in all, we had a great run at it. Especially pleasing was that time at HMB when we beat Don Garlits and Connie Swingle for Top Eliminator. Yes, that little tiger of a Chevy knocked off that big, bad 454 cid Chrysler-Don was not pleased. 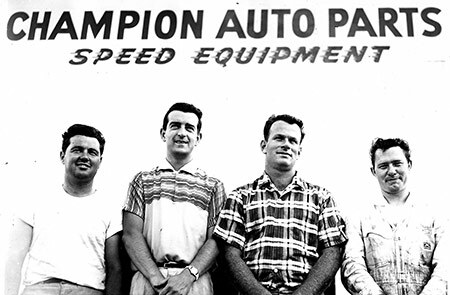 Bud Barnett: I knew about Champion Speed Shop from my days driving the Scottie's Muffler A/HR in Southern California. I moved to Northern California to attend San Francisco State University. One day I just went down to the shop and introduced myself to Don Smith. They needed someone to run the shop in the evenings, so I started working for them after classes. I also told Jim that I was looking for a ride. After about six months, I got a chance to make a run in Ted's car at Cotati. About the same time, Jim decided to build a second car with a Chevy engine because Ted wanted to put a Chrysler in the older car. I became the driver of the red Chevy dragster and Jim drove the black Chrysler rail. Ted was real concerned that Jim might get hurt driving the more powerful Chrysler, and being a father with two young kids, urged him to quit driving. I eventually ended up driving both dragsters. Rod Stuckey used to come out to the West Coast for the winter meets and frequently stayed at my apartment. He had a Fuller car with all the best equipment on it. 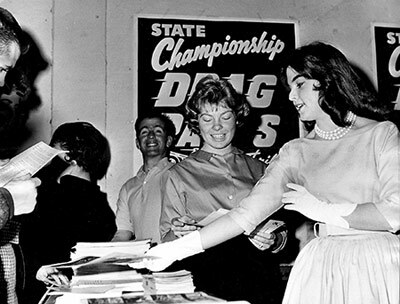 After the 1961 March Meet, Rod was at HMB for the big California State Championship event. Unfortunately, he had an engine explosion that weekend and suffered bad burns from the accident. 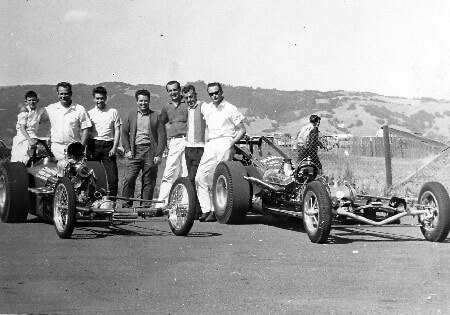 He had contracts to satisfy for races at Cotati and Fremont, so the Organ Grinders got together and repaired his dragster. We were able to meet those obligations while Rod recovered at Sequoia Hospital in Redwood City. I beat Bob Sullivan with the Gotelli car at Kingdon for the #5 spot, and two weeks later wrested the #2 spot from Chris Karamesines with the Stuckey car. Jim organized a benefit race for Rod at HMB, which was held exactly one month after the accident. It was April 30, 1961, and I drove both the Chevy and Chrysler cars that day. We won top eliminator; set low e.t. and top speed. Ted put a new set of M&H slicks on the Chrysler car and said let's go for the record. We had been having some injector and supercharger problems that day, so we put Rod's stuff on the engine. Right before the first light, there was a tremendous blower explosion that severed the fuel lines. Unlike Rod's fire that came from underneath the firewall, this inferno came right back at me. In order to avoid the creek at the end of the track, I steered it off to the left. I hit a drainage ditch that ripped the front wheels off causing the dragster to flip end over end. Like Stuckey, I ended up in the Sequoia Hospital for several months from the severe burns I received in the accident. Also, I'm probably the only guy to miss his college graduation ceremony because of a drag racing accident. After the crash, Ted took a torch and cut up the chassis. He had already ordered a new Fuller car, but was not sure he wanted to take delivery of it. I told him to get back to the business of racing and not to worry about it. 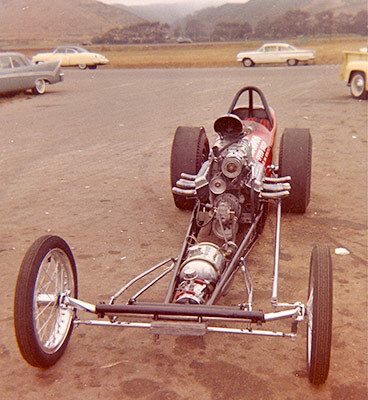 After the accident, I continued to help both Ted and Jim with their dragsters, but that memorable day at HMB effectively ended my driving career. Jim was one of the nicest guys ever to enter my life; I used to call him "father" and Dot "mom". Jesse Schrank: Jim was an outstanding person who would do anything for you that he could. He helped us in a lot of ways, especially during the time we raced our record-holding B/FD. 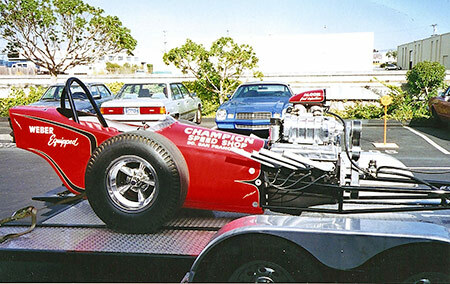 Most of the equipment we used for the dragster came from Champion Speed Shop and we got it at a really affordable price. We raced against Jim a lot. He did not like to lose a race, but was real gracious when he did. I recall everyone got along OK until it came time to race-we were very competitive and nobody liked to lose. 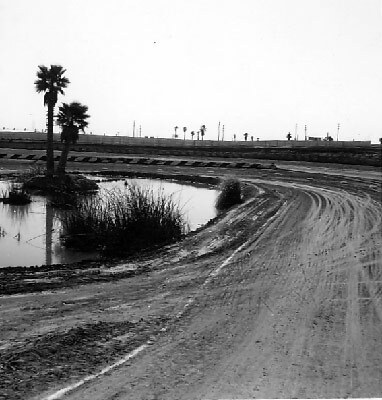 HMB was short, but in those days all the tracks were short except for Riverside Raceway. That just made you "stay on your toes" because nobody wanted to end up in the creek like Gary Cagle and Big Bob Haines. Despite the obvious dangers, we had a lot of fun during those days at HMB and Fremont. I'm glad I was able to race during that era and guys like Jim McLennan were there to make it possible for us. "No better way to end this story than with a magical moment in Bay Area drag racing history frozen in time: Jim racing Don Garlits with flagman Andy Brizio in the middle. Note: the bread truck in the background doubling as a portable timing tower (1960).